The winner of the 4qt Stainless Steel Pressure cooker is Birdsong! Update (10 April 2013, 2:30pm): Since I did not hear back from Birdsong, I asked my FB readers to give me three more numbers. The winner of the giveaway is Geneva! Congratulations! The celebration is not over! I intend to remind you that I have been blogging for ten years, every so often throughout this year! The next time I do, I hope to have something to giveaway that can be shipped global. Fingers crossed as I work that one out! My friend, Wendy, has been trying to get us to come over for her favorite holiday, Easter, for the past several years. Since this is invariably over spring break or just after, we have either been away on vacation or we have had Balvihar on Easter Sunday. The last time we did anything for Easter was probably four years ago when Medha joined in our Annual Neighborhood Easter Egg Hunt. One of my neighbors continues to organize the hunt even though the youngest of her four children will soon be high-schoolers. Candy-filled eggs--12 per participating child--are dropped off by their families and these are then hidden in various places, even flung into the Open Space, for the little ones to find. The planets aligned this Easter and I got to see what I have been missing out on all these years: a beautiful table, with food to please the omnivores, the vegetarians and the gluten-free. We were all very grateful for the effort put into each dish and there was only harmonious munching at this table of diverse palates. I took a toned-down version of my chhole with dhansaak rice, which everyone truly enjoyed. I know they did because all leftovers were distributed equitably between the guests. Wendy 'hid' about 120 eggs filled with candy all over her yard. Some were ridiculously easy to find, while others were not. The group returned with about 5 less than the ones she set out and, much to everyone's amusement, one from last Easter, too! We settled down to pavlovas with lemon curd and whipped cream made by Sam, and painted wooden eggs. Mine were rather pathetic but the girls did a great job. It was the nicest Easter I have ever had! The most interesting thing about this event was that no-one was particularly religious but everyone joined in the fun and good conversation. That's my take away from these celebrations: bonding with good people over excellent food, always a pleasurable experience. It has been my good fortune to make friends through this blog, and my friend Raji was one such gem. It was a year in February that we lost her to a congenital condition that did not crush her spirit or enthusiasm for life. She lives on through her blog, and through conversations that were as engaging as she was. When I visited Anita in New Delhi a little over two years ago, Raji came bearing a rice dish that had been cooked in coconut milk with a medley of flavors and spices. She called it brinji and I haven't been able to forget it. When Nandini visited me six months later, we cooked it together, making changes to suit the ingredients at hand. Nandini is about the best sous-chef to this home-cook and we had a wonderful time celebrating the joy that food bloggers spread through their work. Anjali also joined us, unbeknownst to her, as we made her special Mumbai Special laadi pav. I have made brinji over and over since then. My version is a little richer than Raji's original version because of the sweet nuttiness of canned coconut milk. It is also a little more green as I use more cilantro and mint in an attempt to match the flavors that Raji brought with her. I usually make brinji when I am entertaining, which is why I make a fair amount, and then some more. The leftovers are packed away in small containers and put away in the freezer, sometimes for a weeknight meal but mostly for Medha's school lunch. Rinse the basmati rice in several changes of water. Then soak it in 6 cups of water for about 15 minutes. While the rice is soaking, put all the ingredients for the green masala into your blender and blend into a smooth paste. Measure your green masala in cups. This step is important as it ensures that the rice is not mushy. Heat oil in a large saucepan or kadhai and when it shimmers, add cloves, cardamom and tejpatta. When fragrant, add sliced onions and sauté until they are lightly browned. Add the green masala, followed by the mixed veggies and mix well. Drain the rice and add it to the kadhai, stirring to mix well. 1.75 + 1.25 + 3 = 6 cups of liquid, which is twice the quantity of rice used, 3 cups. Add salt to taste and bring to a boil on medium-high, about 10 minutes. Once the liquid level has dropped below that of the rice, cover and cook for another 15-20 minutes until the rice is completely cooked without being mushy. Each grain must be separate. Serve hot with yogurt or raita and Indian pickle. This recipe can be halved successfully. Don't worry if you need to add more water or coconut milk to make your blender spin, like I have to. Remember to measure your green masala so that the total liquid added to the rice does not exceed twice the quantity of rice used. Taste the masala after you add salt. If it's salty, you're good. If not, add a little bit more. It is absorbed by the rice and is just right once it is cooked. This is one of Medha's favorite lunch foods. Brinji with plain homemade yogurt and she's a happy girl. So happy that while she's willing to share her lunch, she's not willing to swap her lunch box with a friend. In her words, "It's not that I don't like what you brought; it's just that I really really like my own lunch!" Raji's brinji has inspired short stories as well as thoughtful introspection. Many of you joined me in celebrating Raji and I thank you for that. She was truly special. And, so are all of you. For a sweet end to this post filled with gratitude for friends, virtual and IRL, take a gander at my Pineapple Muramba on the Whole Foods Market Cooking Blog. Fantastic post and Congratulations to the giveaway winner! I am totally making the Brinji (which, to my enormous relief has *nothing* to do with brinjals (yaaaaaaaay!!!!) and the Pineapple Muramba, this will be my very first attempt at it, wish me luck ;). Have a great weekend, Manisha. Glad you had a great Easter :)Thanks for sharing those lovely pics. I am bookmarking this and will be trying soon. We are indeed lucky to have known Raji. This recipe was bookmarked a long time back but I stumble on coconut milk because it is not a staple in my pantry- don't want to bother with making such a quantity. But I have to stock up on idli rice and the same store also stocks coconut milk too. I think I cannot resist anymore looking at your really green version! To many more years of IFR! Manisha I did not get around to making the Brinji which I did want to make in memory of Raji but any day to remember her is good so I will one day make it and post it too. I need to make the laadi paos soon. Thanks to this post feeling nice and warm inside at a time when I need it. Love to the bloggers community! Congrats to Birdsong! And that Brinji looks delicious. I love green food. Thanks for another inspiring recipe! Congrats to Birdsong. Looks delicious. Bookmarked. It sounds like Medha has the best school lunches ever. Lamb Korma and vegetable pullao? (Don't want to monopolize Wendy's FB page) You're killing me! Any interest in adopting a daughter who is older than you? Yum! Awesome recipe! I just have one question. I don't see any tomatoes or yogurt. How does this dish get its sour flavor? Unfortunately, I did not hear from Birdsong nor did I have a way to contact her. I gave her an extra day and then decided to poll my FB readers for three more numbers. And, we have a new winner! Manasi, the pineapple muramba is very easy. Let me know what you thought of both the brinjal-less brinji and the muramba! Namitha, yay! And thanks for letting me know that you and your family enjoyed the brinji! Pel, we first met over a Spring Fling! Remember that?! Spring is here and we have snowstorms to prove it, too! And, thank you! Anita, make it! You know it's yummy! You might want to stick to Raji's original proportions of mint and cilantro. Our greens don't have as much flavor unfortunately. Gabi, and it's vegan! I hope you enjoy it! Julia, ha! ha! We had to work a lot to get here! There was a time when Indian food in her lunch box was a complete no-no. And, you must know, that at least 2 days of the week, she takes regular deli sandwiches or a veggie burger. And, sometimes, even those frozen noodle bowls, which have been mistaken for Indian food just because she's Indian. I kid you not! Di, brinji is not sour. Cooking the rice in coconut milk lends it a slightly nutty, sweetish flavor that is balanced by the whole spices as well as the spices in the masala. If you like, you can always squeeze lemon juice over your serving. Congratulations to Geneva. Hope she gets in touch and claims the cooker. Thanks for the link to the brinji story. It kinda wrote itself in the story. I have since adapted the recipe too with much less coconut and no mint. Oh my goodness!!! I am so excited. The first gift was learning how to use the pressure cooker. As soon as I cut the water in half, everything improved. Now this...Thank you, thank you, thank you. 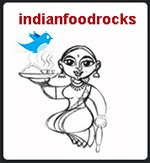 I'll be watching for more excellent recipes, Manisha, and celebrating your next ten years.